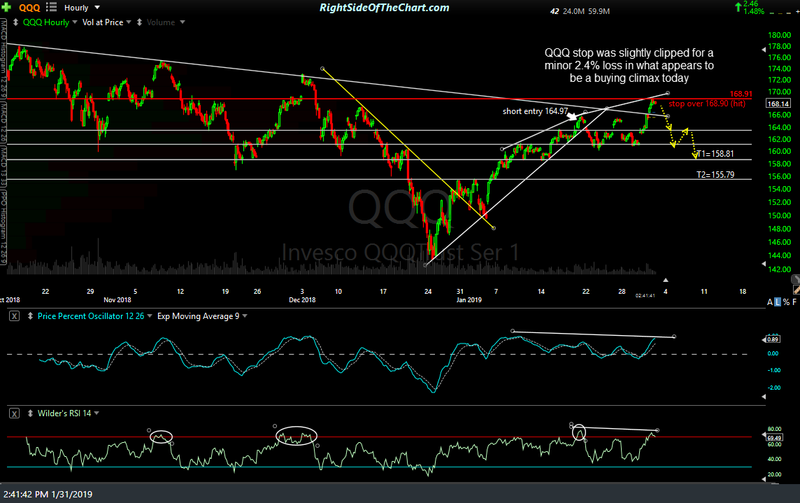 The QQQ (Nasdaq 100 ETF) short swing trade has hit the suggested stop of 168.91 for a 2.4% loss. While I still very much like this trade, remain short personally & will most likely QQQ back as another official short trade very soon, at this point it would only be prudent to wait for AMZN’s earnings to be out of the way (Amazon reports after the market close today). You might recall that in the past I would set the stops on many of the official trades based on either a daily close or a 60-minute candlestick close above a particular level, which was strategically selected. Stops on a daily or an intraday candlestick close do take a hands-on approach to compare to the more commonly used “set-it-and-forget-it” good until canceled stop loss orders. Using those end-of-day or -candle stops results in a lot of questions & confusion from members & as such, I will include some details on how to manage those type of stops with a new entry on the FAQ page, under Trading Related Questions as I will likely go back to using those conditional stops on certain trade ideas. It appears to me that the market is in the final stages of an (at least) near-term buying climax and as such, it is not unusual to see intraday spikes through resistance levels & what might have normally been (but not in hindsight) well-placed stop levels such as we had with both QQQ & XRX today with both briefly popping above their stops, only to immediately fall back & remain below those level since. Again, let’s wait to see the market’s initial & subsequent reactions to Amazon’s earnings & then I’ll make a decision as to add back QQQ & XRX as official trades or not. Thank you so much for the update. I will remain short for another day or week. I would appreciate receiving notification when you personally close this trade. Thank you for your hard work. Thank you Randy for the update and hard work as well. What a kick in the pants, as we watch QQQ pivot from 168.99 and drop now as I type. It’s like the market makers were reading your official stop on this one and decided it would be a good pivot. Thanks for the update. With this volatility I’m scaling into positions in increments and using loose stops. Took your unofficial IWM short for a try. QQQ looking week on hourly, but still looking like wants to creep up. maybe tomorrow we start getting a creep down for a bit at least.